Your garage door is a large, complicated machine. It’s designed to lift and suspend a door that weighs several hundred pounds, in other words, it’s very powerful. This means that most jobs should only be handled by professionals - many of the systems involved are too dangerous to handle if you aren’t fully trained. This is why we always advise homeowners to get in touch with our team if they're dealing with a problem. Read on for some jobs you never try to tackle yourself. If your springs have failed, your door will stop working. This can be frustrating so it's understandable that you'll want to try and fix things yourself. This is a bad idea, though. These springs store a huge amount of tension in their coils, and can easily cause injury to anyone around if not properly handled. If you're in need of a new torsion or extension spring, we strongly recommend that you contact our team of professionals. Doors can be damaged more easily than you might think - it's often a good idea to swap out damaged panels as soon as possible. Again though, you shouldn’t try to handle this yourself. Our team supplies replacement panels for all makes and models of door, and will be able to fit your new panel more quickly and safely than you could on your own. The opener is the most important and complicated part of your whole garage door system – for effective functioning, it needs to be connected perfectly to all the other components. It’s very easy to get this wrong, though, and the results could be catastrophic - an opener that isn’t properly calibrated can quickly damage the rest of the door, leading to potential accidents and breakdowns. A key part of making your door safe to use is keeping it balanced. If the door gets left half-open while the opener is disconnected, it shouldn’t slam shut; if it does, it's likely you’ll need to adjust the tension of your springs. For safety purposes, this shouldn’t be done by anyone who isn’t a trained professional. If you're struggling with any of these issues, don't risk your own safety and further damage in trying to get rid of the problem. 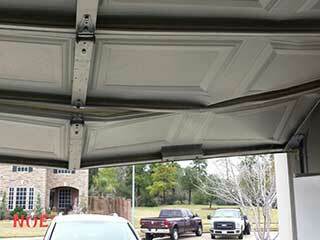 Contact our experts at Garage Door Repair Huffman for assistance instead – we're here to help.